For the first year Filmarmalade, a London based publisher and DVD label specialising in contemporary artists’ film and video works, teams up with Arnolfini to celebrate their launch. Alongside other short works and interviews we will screen recent Filmmarmalade releases: Pil and Galia Kollectiv’s Co-Operative Explanatory Capabilities in Organizational Design and Personnel Management, Beth Fox’s A Marvellous Negative Capability and the world premier screening of The Modern Language Experiments’sImagining a Re-Synchronizing (The Phantom Twin). Videos will be showing all day. Entry is free. At 6.15pm, the screening will be followed by a public discussion with the artists’ and the artist-publisher Gordon Shrigley. Pil and Galia Kollectiv’s Co-Operative Explanatory Capabilities in Organizational Design and Personnel Management, is composed of a series of still photographs taken from an online archive that documents the transformation of a pioneering computing company into a religious cult. The work investigates the place of creativity in efficiency management and the operation of bureaucratic systems in a post-industrial work environments. Pil and Galia Kollectiv recently exhibited work at The Showroom Gallery, London, the Trade Gallery, Birmingham, Royal Standard, Liverpool and has screened work at the Oberhausen film festival, Limoncello, London and at the Whitechapel Art Gallery, London. Pil and Galia Kollectiv were born in Jerusalem, Israel and live and work in London. Beth Fox’s, A Marvellous Negative Capability, records two high camp art critics discussing a work of video art to camera. The work parodies and yet ultimately celebrates, the various forms of metro sexual postmodern contemporary art criticism and its marked tendency to luxuriate in the eternal return of the absurdity of discourse and its many tautological obsessions. The Modern Language Experiment’s Imagining a Re-Synchronizing (The Phantom Twin), follows a collection of unnamed characters through a series of imagined future urban landscapes whilst discussing and quoting two literary works, one real and one imagined. The work investigates the temporality of the imagination and its marked tendency to live possible alternative futures now. The Modern Language Experiment recently exhibited work at Angus-Hughes Gallery, London, Garis and Hahn, New York, the Bermondsey Project, London and at the Sluice Art Fair, London. 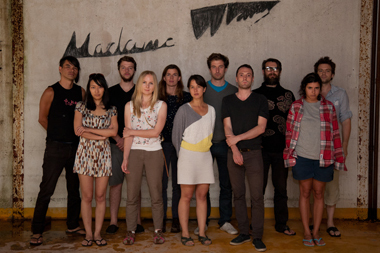 The Modern Language Experiment were formed in 2007 and are based in London. Michelle Deignan’s and Carmen Billows’ first collaboration embraces the detours of their dialogue. A conversation that began with the subject of representation, has evolved into an artists' film and performance event. Featuring work by collectif_fact, Michelle Deignan, Nooshin Farhid, Patrick Goddard, Hannah Jones, Rabih Mroué, Benny Nemerofsky Ramsay, Michael Robinson, Matthew Stock and Stefan Sulzer, the programme is an unpredictable associative journey through places, plots and characters. Be there from start to finish! Black Maria is a major new commission by the British artist Richard Wentworth working in collaboration with GRUPPE, an emerging Swiss architecture practice. Film Still, Benny Nemerofsky Ramsay, 'Live to Tell"
Launch: Madame Wang Issue 2: Self Assessment. Saturday November 5th 2011 Banner Repeater. 6-9pm. Madame Wang ranges over the poles of collaborative reflection, from evocations of Whitehead-like societal intensities to re-appropriated 80’s business speak. It aims to challenge and synthesise experiential and theoretical voices coming from thinking about being together that range from mystical anthropology to object oriented approaches. MW II has been born from an intensive week long self assessment programme playing out the possibilities and fantasies of the communal spirit. Contributions from: Nicholas Carr, Tom Trevatt, Matthew Stock, Pil & Galia Kollectiv, Jo Ying Peng, John Colenbrander, Friederike Hamann, PsychoanalYSL, Jessica Tsang, Am Nuden Da, July Video Coalition. Editors: Sam Basu & Craig Cooper. Screenings at 7pm and 8pm. 1) Library, Auto Image Series 7’44” 2010. 2) Production Stills, Auto Image Series, 3’30”, 2010. 3) Astral Evidence 5’48” 2011. (footage filmed at Banner Repeater). Signs for the Future: Spensers, Kaliv Ir. 2011 duration 5:57. Self Assessment Object by John Colenbrander and Friederike Hamann (installation in bookshop). Madame Wang invitation to synthesise material generated within the context of the magazine. It will produce a meta-journal that will analyse the latent possiilities od publication, project authoring, and new approaches to knowledge creation. This week of self assessment will seek to exceed the appendix or addendum format of supplementary commentory and incorporate a cross analysis of the data in Madame Wang. The self assessment will take place within the context of Treignac Project, France through a series of informal discussion, readings, film and events. NIS membors Matthew Stock and Craig Cooper present the work produced by NIS over the past two years, as part of the programme of events by the MA Curating course. This is the first of the series of November Screenings & Talks at the MIG (Made in Goldsmiths) Gallery. Hosted by a different curator each time, the series aims at discerning a variety of approaches to a broad question provoked by the educational context in which the gallery operates: What is it to receive? The invited artists are asked to use the format of video or film to start a conversation on how they understand this question and how issues around it have been formative in their art practice. Although initially inspired by the intrinsic situation of Made in Goldsmiths gallery, the series aims at going beyond these confines and negotiate an expansive set of cultural references. Artists Craig Cooper and Matthew Stock will kick off the series with thoughts on New Collaborative Practices. By way of avoiding the question of receiving as a singular process, they suggest "looking at the number of opportunities one has to receive and the situation of having a great density of obligations and rewards from this." Although both artists have individual practices, they will focus on their geographically dispersed collaborations with the New International School (NIS) & Madame Wang, and share their observations on other examples of mobile coalitions of artists. By proposing the term Betweenness Centrality, used mostly in graph theory and network analysis, they offer a different way of appreciating the role of each member in the ever changing traffic on the paths between them. 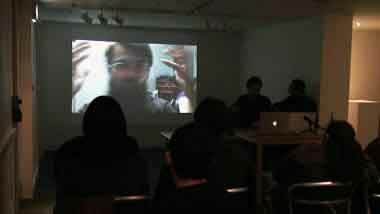 The talk with start with two recent videos made with NIS: A Tergo (2009) and A May Night, Or The Drowned Woman (2010). Made in Goldsmiths Gallery is directed by the Goldsmiths, MFA Curating, Part 2, for the 2010-2011 academic year. The programming will establish a communal atmosphere, defined by dialogue, confrontation, and negotiation. Rotating exhibitions and events will involve intelligible activity with formal practices. Diagnosing key artistic processes situates the exhibition space in a comparable forward thinking position. The Made in Goldsmiths Gallery is conceived as more of a platform/pretext than a space. NIS will be shooting its first full feature Horror film, which will again be located at The Treignac Project in the south of france. The horror film is in production and due for release in the summer 2011. The Treiganc Project is located in the south of france. It is run by Sam and Liz Basu. The Treignac Projet is an off centre, peer-initiated organisation, directed towards collaborative activity within the arts. The project is modelled on the University rather than the regional Arts Centre, where research and teaching, auto-administration, and academic independence, all come together through the efforts of a network of Peers. This exhibition is an investigation into the importance placed on truth by artists and audiences alike. This show will question the extent to which the truth lies in the interpretation of the work and, once found, whether this truth is in reality a deceit. Italo Calvino, in his novel, Invisible Cities brings together a storyteller, Marco Polo and an emperor, Kublai Khan. Polo is charged with the task of walking Kahn's land and recounting tales of its cities; tales, which to the reader and ultimately to Khan, seem only to resonate from Polo's imagination. Through this deceit Calvino is investigating ideas about truth and interpretation and as the story inconclusively ends it leaves Kahn in a paradox unable to decipher the real from the imaginary. Each of the artists in this exhibition takes a direct and distinctive approach to this deceit, whether it is in its processes, interpretation, imagination or narrative, like Polo they are forcing the viewer to ask "do I believe what I am seeing or hearing?" and like Khan the viewer is left in an eternal paradox that exists balanced on the thin line between deceit and truth. Opening night 31st July 6-11pm. For the second project V22 PRESENTS have invited 5 artist curators to select works that engage with current developments and critiques in contemporary Sculpture. Through bringing together diverse approaches and understanding from international artists, groups and projects V22 PRESENTS: The Sculpture Show is an opportunity to engage with the diverse potentials that have come to encapsulate, and exist within, the definition Sculpture. Matthew Stock will be showing his video work "The Suit"